Maori Warriors with painted faces and intense expressions pose for the camera at the Wairakei Terraces Maori Village near Taupo on the North Island of New Zealand. The Maori people are the indigenous people of New Zealand. 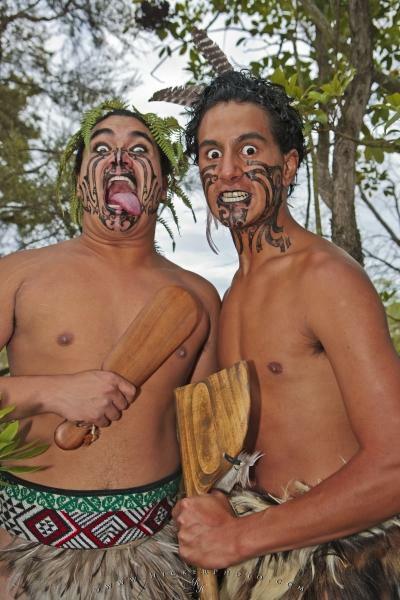 Two Maori Warriors stand with their makeshift weapons and their painted faces, staring intensely into the camera at the Wairakei Terraces Maori Village near Taupo on the North Island of New Zealand. A visit to this Maori Village gives a visitor the chance to learn firsthand about the history of the Maori people and their culture and see how it has enriched the country of New Zealand for hundreds of years. Village near Taupo, North Island, New Zealand. Pictures from photo gallery "Maori Pictures"
This picture is part of the photo album "Maori Pictures" - there are more beautiful images waiting for you. ... The Maori culture is still steeped in mystery and intrigue and it is exciting to outsiders to get to be a part of that, even if for only one evening. It is thought that the Maori people arrived in Polynesia sometime around 1300 and they settled the islands and made them their home. It was after the Europeans arrived that their numbers began to decline due to disease and fighting, but in the 1960s the Maori people enjoyed a cultural revival. Maori Warriors at the Wairakei Terraces Maori Village near Taupo, North Island, New Zealand. I photographed this photo with the digital SLR camera model Canon EOS-1Ds Mark II, aperture of f/5.6, exposure time of 1/60 sec. on ISO 100, as always I used a original Canon Lens, the focus lenght for this picture was 34mm.